The cover is very cute and quite appealing. Anybody looking to read an interesting teen fiction story is bound to be drawn in by the cover. 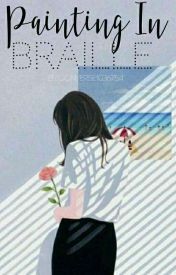 The title also fits perfectly, as the story is about a young woman who goes blind, and braille is the writing system that is commonly used by people with visual disabilities. The descriptions overall are very bland. You need to add more sensory details in order to really create the setting for your audience to picture. Be sure to mention things such as what the setting smells like, looks like, sounds like, etc. -Chapter 1: "She huffed opening one eye prepared for the sun to shining through her window, but it was still pitch black." This sentence is a run-on. The word "shining" should also be changed to "shine." -Chapter 1: His eyes adjusted to the darkness of the room revealing a skinny young women." The word "women" is plural, but the story is only referring to one woman. -Chapter 1: "&apos;Your going to have to trust me,&apos; he said." The word "your" is used improperly. It should be "you&apos;re," as in "you are." -Chapter 2: "...others had their head down against their knee&apos;s crying." The word "knees" should not have an apostrophe, as the knees are not in possession of crying. -Chapter 2: You wrote "...arrosing worry." "arrosing" is not a word, but I assume that you meant to write "arousing." -Chapter 3: "Hoe was she going to pay for the bill she was jusf in college..." There are two typos in this sentence. Be sure to always proofread your work before posting it. I noticed that one sentence in Chapter 1 contains a misplaced modifier and unnecessary comma: "Her body flew up looking around at, nothing." This sentence is written as if the character&apos;s body was looking around rather than her eyes. Additionally, the comma between "at" and "nothing" adds a very awkward and unneeded pause. In Chapter 1 you wrote "Across the hall a guy ran the water in the sink, to get access hair gel off his hands." I assume you meant to use the word "excess" instead of "access." Additionally, the term "a guy" is very vague. It would be best if you used a name or a physical trait to describe him. I also observed that you change the tense of your story. The story as a whole seems to be written in past tense, but some sections are written in present tense, such as: "The keys jingled as the door clicked locked (past tense). He straightens his tie (present tense), taking a breath, to calm himself." Throughout the story, there are many unnecessary commas, adding constant awkward pauses. Be sure to proofread your work, and remove any commas that sound as if they halt the flow of the sentence. I suggest that you mention names earlier in the story, as the audience is sometimes confused by who the characters are. The lack of names and physical descriptions in the first chapter make the characters seem more like robots than people. If you add clearer descriptions and background details on the characters, the audience would be able to relate to and understand the characters more easily. Additionally, in Chapter 1, you used a photo of a paintbrush to separate the characters&apos; viewpoints. This is very confusing to the reader, and it took me a moment to realize that the second half of the first chapter was written about a different character than the first half. In order to clear this confusion, perhaps you could separate the chapter into two chapters or use a clearer symbol to divide the sections. Later in Chapter 1, you changed the viewpoint from the boy to the girl again, which made the chapter overall quite confusing. Some sections in the story were a bit jumpy. For example, in Chapter 1, you explain that a person is washing his hands at his sink. Three lines later, you explain that a door clicked locked. What door is this? Who locked the door? What happened to the boy washing his hands? Be sure to go back and clarify this. I find it to be quite unrealistic how the character suddenly wakes up blind one morning (Correct me if I&apos;m wrong; I don&apos;t know much about Kingsley&apos;s sudden disability). I also find it to be unrealistic how the character calls for help when she thinks her apartment is being broken into. Personally, I would never verbally call out for help if I thought somebody were in my home. I would instead likely hide and try to call the police. It also makes no sense how the character&apos;s next-door neighbor instantly assumes that she is blind and offers to take her to the hospital. I feel that there should be many more details in Chapter 1 as a whole. I also suggest you add some additional sensory details, as I find it difficult to imagine how the characters look, what their apartments look and smell like, etc. In Chapter 2, the doctor instantly begins telling Kingsley that he will organize to have somebody help her with her vision problems. However, he does this before asking her any major questions or conducting any tests. It makes little sense how she simply woke up blind and nobody is sincerely worried about it. The characters overall are very bland. In the beginning of the story, there are no physical descriptions, and we don&apos;t even know the main characters&apos; names until the end of Chapter 2. The characters also seem to have fairly boring personalities, as nothing is described and their conversations are dull. Are the characters funny? Witty? Intelligent? Rude? Be sure to mention this. Overall, the story is very cute and unique, but there are several grammar mistakes that need to be fixed. The setting could also be more thoroughly described. The first thing that you could work on in order to improve your story is character development. Without developed characters, the audience doesn&apos;t understand how the characters are feeling or what they are experiencing. They are also very difficult to imagine without any physical descriptions.